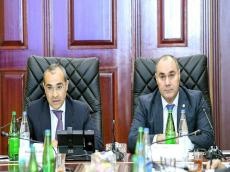 Azerbaijan’s State Customs Committee hosted a joint meeting of the boards of the State Customs Committee and the Ministry of Taxes to discuss the implementation of the “Action Plan to improve the control system of export-import operations” approved by the decree of Azerbaijani President Ilham Aliyev dated July 28, the State Committee said in a message. The meeting was attended by chairman of Azerbaijan’s State Customs Committee, Lieutenant-General of the Customs Service Safar Mehdiyev, Minister of Taxes Mikayil Jabbarov, as well as the heads of relevant structures. Mehdiyev touched upon the importance of the flawless implementation of the presidential instructions to both structures in a short period of time. Mehdiyev also noted that the State Customs Committee and the Ministry of Taxes established links of effective cooperation and all entrepreneurs and business entities will feel the benefit of this cooperation in their daily activities. In turn, Jabbarov noted that holding the meeting in an expanded format will serve expanding cooperation between the two structures and the joint activity will be continued in the future to successfully fulfill the instructions of President Ilham Aliyev. The minister also noted the need to intensify the work envisaged by the action plan. He added that the measures taken to coordinate the activities of the customs and tax authorities will have a positive result. Then the representatives of both structures made a report on the work on the implementation of the action plan and spoke about the organization of the mutual exchange of information, a single platform for risk management, changes in the legislation and other issues.